President Emmanuel Macron's attempt to quell violent rioting across France by offering economic concessions to his countrymen -- expected to cost the country $11 billion -- appears to have been insufficient. Leaders of the "Yellow Vest" protest movement indicated Tuesday that Macron's offers were not enough, as hundreds of students staged a "Black Tuesday" of protests over Macron's education policies and voiced solidarity with the Yellow Vests. Macron took to the national airwaves to address the spiraling crisis for the first time on Monday. He announced an increase in the minimum wage, tax cuts for retirees and other concessions aimed at calming the streets. But CBS News correspondent Charlie D'Agata reported on Tuesday morning from Paris that another day of Saturday demonstrations -- the mass-protests which have been seized upon by extremists of all stripes for four weeks in a row -- still appeared on the cards. The crisis began as protests against a planned fuel tax hike (which Macron has abandoned), but quickly mushroomed into a broad and visceral demonstration of anti-government resentment aimed squarely at the president, who is seen by many as being out of touch with the working French. The Yellow Shirt movement gained new support on Tuesday from another group of French citizens angry over changes brought in by Macron's government: students. There has been a fierce reaction from high school and university-aged students to new standardized testing policies, a lack of college enrolment places available to graduates, and new requirements for graduates to secure those places. One student protesting in Paris on Tuesday, who gave only his first name, said he saw a "link" with the Yellow Vests over what he called "despair in the society." "On the part of students, we're tired of not being listened to. There's no chance to be listened to, we're not being taken seriously. Our claims are not being taken seriously," Dragan told Reuters. "The interest in the Yellow Vests is that if we go under the same banner, the more we are, the easier it will be to make each other heard and bring forward each other's cause." Groups of students set fires and blockaded schools from Paris to the south of France on Tuesday. 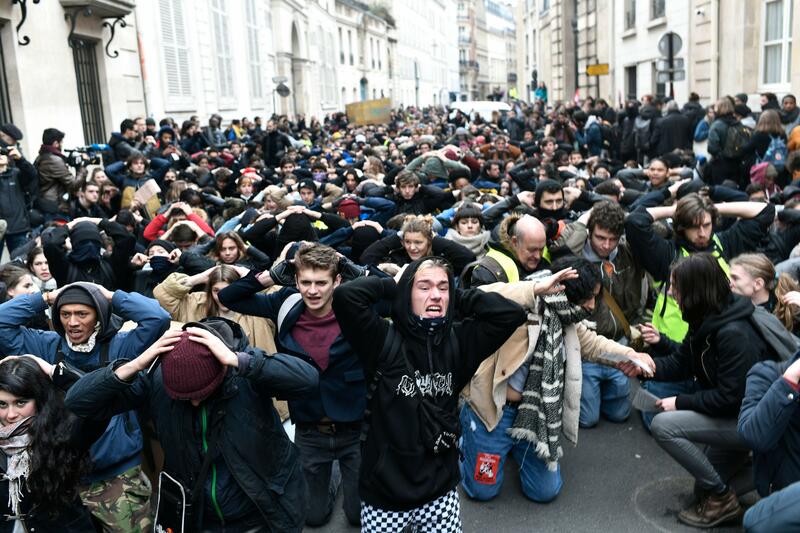 Thousands of high school students gathered in central Paris and elsewhere across the nation and knelt on the ground with their hands behind their heads in front of police -- a symbolic show of solidarity with fellow students arrested last week at another school protest.